I've been so busy sharing our Easter crafts this week, I thought maybe it was time to mention a few of the snacks we've enjoyed along with them. Then one of the Twelve—the one called Judas Iscariot—went to the chief priests and asked, “What are you willing to give me if I deliver him over to you?” So they counted out for him thirty pieces of silver. From then on Judas watched for an opportunity to hand him over. Tint 1/2 a batch of sugar cookie dough (1 egg, 1/2 teaspoon vanilla, 1/2 cup sugar, and 1/2 a stick of softened butter creamed together, and mixed with 1 cup of flour) gray with a few drops of food coloring. Or, in a pinch, you can use 3 drops of green, and 2 drops of red, like we did for these, but it's tricky - too much red will turn the dough brown, instead of gray. Roll out the dough, and cut 30 "coins" with the center of a donut cutter, or the (clean and dry) cap of a soda bottle. Bake at 350 degrees Fahrenheit for 13 minutes. Early in the morning, all the chief priests and the elders of the people made their plans how to have Jesus executed. So they bound him, led him away and handed him over to Pilate the governor. When Judas, who had betrayed him, saw that Jesus was condemned, he was seized with remorse and returned the thirty pieces of silver to the chief priests and the elders. I found this idea from As the Deer through Google images. There isn't much in the way of instructions on the site, but the concept is simple enough, they didn't prove to hard to bumble our way through. We prepared two pretzel rods for each cross, breaking one, to make a shorter cross beam. Then, we melted vanilla flavored almond bark in the microwave, according to the directions on the package. Half the package, or six squares, ended up being enough to make fourteen crosses. ...followed by a tap or two worth of candy sprinkles, before the candy coating had a chance to harden back up. Since I was in the pretzel aisle anyway, I decided to grab a bag of Snyder's "Butter Snaps", along with a bag of Hershey Kisses®, and a box of fish shaped crackers, for these yummy little treats, as well. ...and top each one with a Hershey Kiss®. Place the pan in a 350 degree Fahrenheit oven, for a minute or two, until the chocolate is shiny, indicating it's melted (don't overbake, or the chocolate will burn and turn hard and crumbly). Then, press a fish cracker down into each melted chocolate, and place the entire pan into the fridge for a few minutes to cool. While your waiting, read the passage from John 21:1-14 about Jesus appearing to the disciples, while they were fishing, after the resurrection. 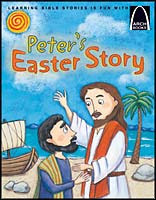 Or, enjoy Peter's Easter Story from Arch Books (we're really loving this series, this year). I love the Easter cross, and that fishers of men snack, yum! All those snacks look wonderful. It looks like a very special time in your house. I love the ideas you have on your blog. What wonderful snack ideas. I will definately have to try them. Thanks for sharing. These are all such cute ideas. I really love the cross, too. Thanks for some fun Easter ideas! I love these ideas and will surely use them for my Sunday School class. thanks for the tutorial, I like the fish crackers. Very cute ideas! Thanks for sharing!